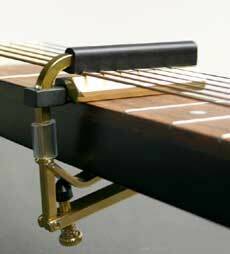 The Shubb clamps solidly to the neck to provide great tone. It uses the same patented locking action of our Shubb guitar capo, and it aligns by touching the fret, not by eye, making it fast and accurate. User adjustable for different string heights.